All those advertisements and hoardings you see on the road about turning off your vehicle’s ignition at stop lights to save fuel are right. It’s kind of a no brainer: you turn off your car and the engine immediately stops using fuel. Did you know? Ten seconds of idling can burn more fuel than turning off and restarting the engine. My old man told me the opposite was true when he was teaching me to drive, but that was a VERY long time ago. Excessive idling can damage your engine's components, including spark plugs, cylinders and exhaust systems. And, driving – not idling – is the most effective way to warm up your engine anyway. Back then, in pre-historic times, engine oils didn’t have the same additive packages they do now and it did take some time to actually warm up and distribute the lube oil to all of the necessary components. Driving with the engine “dry” would cause damage. Modern oils have some serious technology built in which ensures the oil stays where it should and keeps a relatively constant viscosity. Modern start-stop was pioneered by German automakers several years ago and was generally limited to manual transmission vehicles. Today, about 60 percent of the new cars, automatic and manual, sold in Europe each year have start-stop. 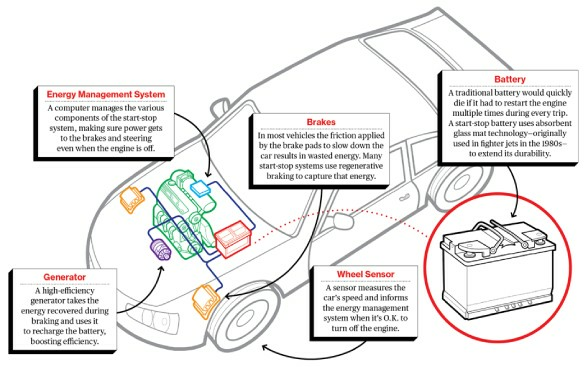 Start-stop technology improves the typical car’s efficiency by about 5 percent. How does it do it, you ask? When cars go into neutral, or brake to a full stop, the engines of cars equipped with start-stop switch off and then start up again automatically when you step on the accelerator or engage the clutch. So, as we’ve previously agreed, keeping your engine on idle while stuck in traffic or when waiting for the signal to turn green consumes more fuel than switching off the ignition and restarting it. According to studies, on an average you waste 0.098 litres of fuel for every 10 minutes of idling. That may not sound much but it all adds up over time. It makes sense to turn off the car if you will be idling over 10 seconds. 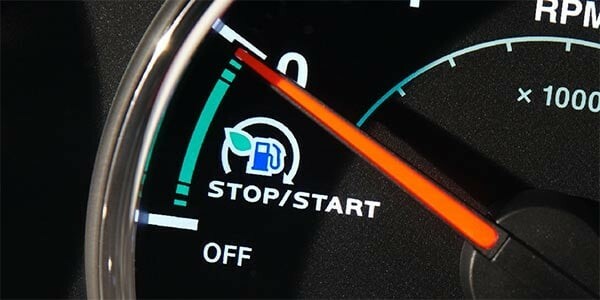 And, tree huggers take note... Start-stop is also good for the environment. While engines today emit considerably far less toxic gases, including hyrdrocarbons, carbon-monoxide and nitrous oxides, than carburettor-based cars of yesterday, cutting down on idling does help reduce CO2 emissions. We would also recommend ensuring your car is maintained properly to ensure it is running a peak efficiency. A car with a full service history will save you money on fuel and repair bills and will then be worth more when you bring it to us as a part exchange. Another tip to remember is to turn off the air conditioner or use it sparingly. Air-conditioning can dramatically reduce fuel economy if you’re driving at low speeds. The effects are not so apparent when the vehicle is driven at higher speeds. And, while you might think that electricals such as defoggers, heated seats, etc use only the battery, fact is that it takes much more running from the engine to recharge the battery again if you’re using these so it makes sense that these fuel-intensive devices should be turned off when not in use. Programming engines not to idle—and saving fuel in the process—may seem simple. But it’s not. When that engine shuts off, all the electrical content, the radio, the blowers, the lights, whatever is consuming electricity, no longer has the alternator so you need a battery that is different than the traditional starting battery. 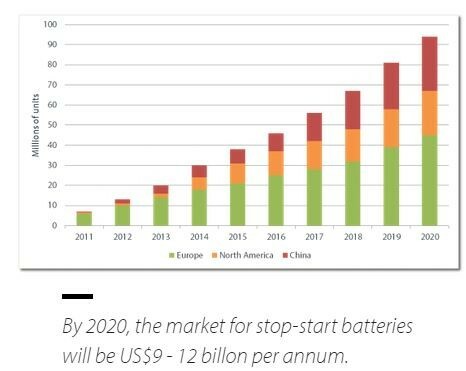 New battery innovation is big business and new technologies such as Absorbent Glass Mat technology that provide more rapid and consistent charging and discharging cycles are being developed. While battery research efforts in recent years haven’t led to a cheap, highly popular, all-electric car, it has spurred a great deal of innovation that makes greater use of electricity in driving. Start-stop technology along with the hybrid, the hybrid-lite, and the plug-in hybrid systems that are being developed in parallel won’t replace dead dinosaurs as a transportation fuel. But they will go some way to displace dino-fuels as a transportation fuel. Start-stop should be a starting point, not a stopping point. There’s more that can be done, even with 12-volt standard batteries. By pairing a small lithium-ion with the more powerful batteries that enable start-stop, vehicle-makers are implementing a series of fuel-saving features, like regenerative braking (which captures the energy from braking to recharge batteries), as well as engines that turn off when cars are rolling at very low speeds and stay off for slightly longer when cars start up again. Such efforts could bump 5 percent savings up to 8 percent. More efficient diesel fuels that initiate the combustion earlier in the engine cycle have been developed that have shown an almost 10% improvement in mpg and an 8% reduction in all harmful tailpipe emissions. Of course, a better battery isn’t the only challenge in making start-stop work. There’s a consumer-experience barrier to overcome. Generations of drivers have become accustomed to the reassuring hum of idling engines, and must grow comfortable with the idea of the engine constantly switching on and off. But the logic of start-stop is inescapable, from both an engineering and a financial perspective. I’m resistant to an all-electric vehicles because I love the sound of a big V8 engine. That is more to do with my resistance to change as I get older but I still use Facebook instead of Instagram which proves what a dinosaur I am. The discomfort can be eased with cash. 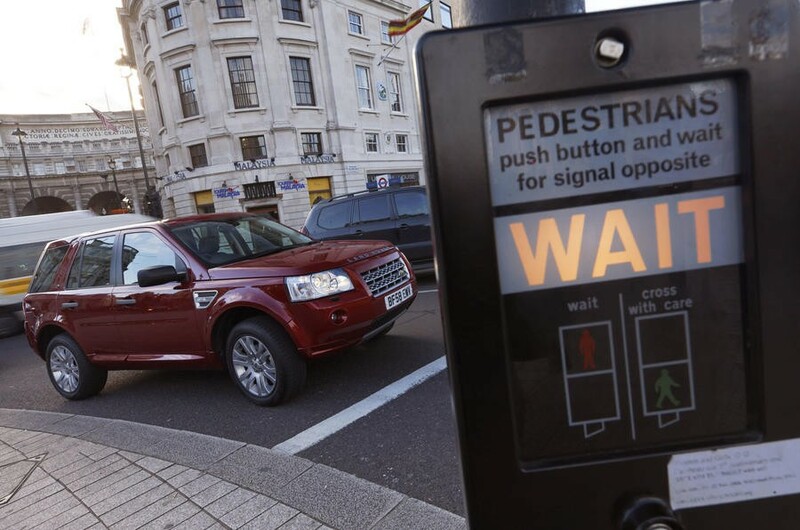 Some estimates show that drivers recoup the additional cost associated with the start-stop technology—about £250 to £300—within three years in the form of less money spent on fuel. The investment then continues to pay an annual dividend of £100 in fuel savings for the rest of the vehicle’s life (assuming fuel prices stay constant). That’s an excellent return by any measure. The start-stop systems in our cars monitor a number of things within the car to determine whether it's safe to switch the engine off. Drivers might think something is wrong because the engine hasn't stopped when the car has stopped, but the system will measure things like temperature of the engine and the voltage of the battery to check that it is safe to switch off. If the engine is too cold or the battery too low, or if safety checks like the doors being closed aren't in place, then the system won't work. It isn’t recommended that drivers turn off their engine at every stop in traffic if they don't have a start-stop system. Modern cars may have brake systems that rely on the engine to create a vacuum that makes the brakes work more efficiently. If you know you'll be stationary for a while it's worth it, but stopping the engine for very short periods gives negligible benefits. · Turn off your ignition if you're waiting more than 10 seconds. Contrary to popular belief, restarting your car does not burn more fuel than leaving it idling. In fact, idling for just 10 seconds wastes more gas than restarting the engine. · Warm up your engine by driving it, not by idling. Today's electronic engines using advanced lubrication products do not need to warm up, even in winter. The best way to warm the engine is by easing into your drive and avoiding excessive engine revving. After just a few seconds, your vehicle is safe to drive. The vehicle's engine warms twice as quickly when driven. · Warm up the cabin interior by driving, not idling. Easing into your drive is also the best way to get your vehicle's heating system delivering warmer air faster. Sitting in an idling car means you are breathing in more of the dirty exhaust that leaks into the car cabin. Any warmth you may get from a car heater is not worth the damage to your health. If parked and waiting, it is healthier to get out of your car and go inside a store or building. · Protect your car engine by idling less. Frequent restarts are no longer hard on a car's engine and battery. The added wear is much less costly than the cost of wasted fuel. Idling actually increases overall engine wear by causing the car to operate for longer than necessary. · Make the air healthier by cutting down on hazardous pollution in your town or community. Idling tailpipes spew out the same pollutants as moving cars. These pollutants have been linked to serious human illnesses including asthma, heart disease, chronic bronchitis, and cancer. · Help the environment. For every 20 minutes your engine is off, you'll prevent one about kilogram of carbon dioxide from being released (carbon dioxide is the primary contributor to global warming). In London alone, idling cars and trucks produce 130,000 tons of carbon dioxide each year. To offset this amount of global warming pollution, we would need to plant an area half the size of Greater London with trees every single year. · Keep money in your wallet and save fuel. An idling car uses fuel but delivers zero mpg. How much fuel is saved is often disputed and depends almost entirely upon the type of driving undertaken with the system. Urban driving where you spend more time stopped than moving will result in greater savings. 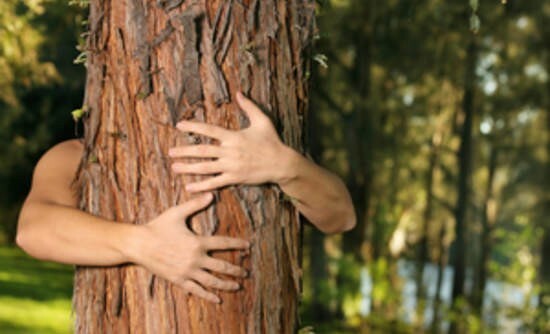 Now that we can all breathe easier, why not drive yourself out to a nice forest somewhere and hug a tree.